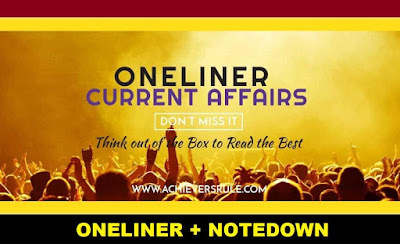 One Liner GK Current Affairs: 27th March 2018 has all the Latest Headlines as those of the Current Affairs Updates and rest of the news as per the recent updated news. All the important news have been mentioned in single sentences. All the Static and GK kind of questions have been mentioned at the end of the article keeping in mind the pattern of SSC and Bank exams. These are very important for the upcoming examinations of IBPS, SSC CHSL, SSC CGL and Railway exams. K Vijay Raghavan, one of the most distinguished biologists of the country, was appointed Principal Scientific Advisor to the Government of India. India has overtaken Germany to become the fourth largest automobile market in the world, latest global data show. The Ministry of Finance has approved a proposal to provide government guarantee of 5,000 crore in the current financial year for Indian Railway Finance Corporation (IRFC) bonds to be subscribed by Life Insurance Corporation (LIC). The beginning of the tourism season in the Kashmir Valley was marked with the opening of Asia's largest Tulip garden here on the banks of the iconic Dal lake. Jet Airways announced its plans to expand its presence in the North East and make Guwahati its regional gateway to/ from the region. The U.S. government's development finance institution, Overseas Private Investment Corporation (OPIC), on Monday, committed a USD 12.5 million (Rs. 80 crore) loan to a project that will expand access to affordable clean drinking water to millions of low and middle-income people in India. Indian Navy’s Talwar class frigate INS Tarkash carried out a “greeting and training” exercise with the U.S. Navy’s Theodore Roosevelt Carrier Strike Group (TRCSG) which was until now involved in operations against the Islamic State in the Arabian Gulf. The Supreme Court (SC) proposed a roll out of Bharat Stage-VI (BS-VI) fuel across 13 metros by April 1, 2019. The Cabinet Committee on Economic Affairs has given its approval for Central Sector Scheme "Integrated Scheme for Development of Silk Industry" for the next three years from 2017-18 to 2019-20. Ministry of Housing and Urban Affairs (MoHUA) in partnership with CII is conducting “3R (Reduce, Reuse & Recycle) Awards and Exhibition” with an objective to reward large, medium, small industry, Start-ups who are involved in the areas of 3R (Reduce, Reuse, Recycle), waste management and recovery, resource conservation and Resource Efficiency. The Swachh Bharat Mission (Gramin), Assam launched a massive campaign titled ‘Mission Sambhav’, in which one lakh toilets will be simultaneously constructed across the state in a bid to make Assam open defecation free by the year-end. A’ National Conference on Down Syndrome’ was organised by the National Trust under Ministry of Social Justice and Empowerment. Bollywood actor Anushka Sharma and shuttler PV Sindhu has been featured in the Forbes 30 Under 30 Asia 2018 list, which includes innovators and disruptors who are reshaping their industries and changing Asia for the better. South Asian Cinema Foundation (SACF), a city-based organisation has received the Frederick Pincott Award for 2017 from the Indian High Commissioner, Y K Sinha for promoting Hindi cinema in Britain for the last 18 years.